Jake Bright is a writer and author in New York City. He is co-author of The Next Africa. South African startup Yoco has raised $16 million in a new round of funding to expand its payment management and audit services for small and medium sized businesses as it angles to be one of Africa’s billion dollar businesses. To get there the company that “builds tools and services to help SMEs get paid and manage their business” plans to tap $20 billion in commercial activity that the company’s co-founder and chief executive, Katlego Maphai estimates is waiting to move from cash payments to digital offerings. 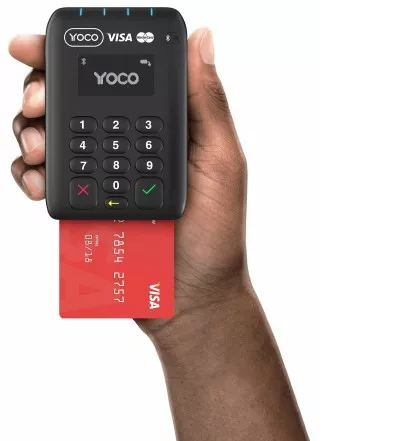 Yoco’s already posted significant numbers for its business connecting small companies to digital payment and enterprise software products. The company offers a point of sale card reader that links to its proprietary payment and performance software at an entry cost of 1799 South African Rand, or just over $100. With this kit, cash based businesses can start accepting cards and tracking metrics such as top selling products, peak sales periods, and inventory flows. Yoco has positioned itself as a missing link to “solving an access problem” for SMEs. Though South Africa has POS and business enterprise providers — and relatively high card (75 percent) and mobile penetration (68 percent) — the company estimates only 7 percent of South African businesses accept cards. Why such a low percentage? “It doesn’t just come down to cost and technology, but the rules that have been set in the market for getting card machines,” said Maphai. He named requirements to provide extensive transaction history, shop location, and revenue requirements as exclusionary factors for SMEs to connect to POS services in South Africa. “Our vision is around open commerce. How do we open things up and remove exclusivity,” said Maphai. Yoco says it is already processing $280 million in annualized payment volume for just under 30,000 businesses. The startup generates revenue through margins on hardware and software sales and fees of 2.95 percent per transaction on its POS devices. Yoco will use the $16 million round on product and platform development, growing its distribution channels, and acquiring new talent. On expanding outside South Africa, Yoco’s Maphai said it’s in the company’s future, but not just yet.